Time of Origin: Precise planet of origin unknown, but both exist in approximately Earth’s present - the Onihr came to Earth a few decades in the future from now - and their similar appearances make it likely that they both evolved on the same planet. Appearances: "Trading Futures" (Onihr), "The Forgotten" (Flashback), "Judoon in Chains", "Smith and Jones", "Revenge of the Judoon", "The Stolen Earth/Journey's End", "Judgement of the Judoon", "Prisoner of the Judoon", "The Pandorica Opens/The Big Bang", "A Good Man Goes to War", "Prisoners of Time" (Judoon). Doctors: Eighth Doctor fought the Onihr; Fourth Doctor, Fifth Doctor, Sixth Doctor, Tenth Doctor and Eleventh Doctor have encountered the Judoon. Companions: Fitz Kreiner and Anji Kapoor encountered the Onihr; Leela and K9, Tegan Jovanka, Turlough, Martha Jones and Donna Noble encountered the Judoon; Amy Pond, Rory Williams and River Song fought the Alliance that the Judoon were a member of but did not actually fight them; Sarah Jane Smith encountered a Judoon with The Bannerman Road Gang. History: Although no direct connection has been made between the Onihr and the Judoon in the series, the odds of two different species independently evolving to look so remarkably like the Earth rhinoceros are so slim that it is almost impossible. Based on available material, the only differences between the two species in terms of nature and appearance is that the Onihr are far more intelligent and ambitious than the Judoon - to the point that they seek to harness the power of time travel to conquer other worlds - and possess a grey skin colour where the Judoon’s skin is similar in colour to humans and The Doctor explicitly stating that the Judoon brain is small enough to be held in a teaspoon. With these in mind, the most likely explanation for their similarity is that the two species are different branches of the same evolutionary ladder, much like the different skin colours that have developed on Earth over the centuries. When the Onihr appeared in the series, they were attempting to harness the power of time travel, having somehow discovered various old Time Lord relics following the destruction of Gallifrey ("The Ancestor Cell") - to the point that they were even wearing Time Lord robes, despite the robes being a very poor fit given their bulk -, and sought The Doctor to give them more information about the secrets of time travel. Unfortunately for the Onihr, while their information about The Doctor was up-to-date enough to be aware of the fact that he had recently lost his second heart due to an operation removing the heart after it appeared to be poisoning him ("The Adventuress of Henrietta Street"), they appear to be relatively ignorant of human biology, with the result that, instead of capturing The Doctor after tracking the unique energy signatures left on individuals who travelled through the time vortex to Earth in the mid-twenty-first century, they captured his companion, Fitz Kreiner, instead, assuming that Fitz was The Doctor simply because he had one heart and had travelled through time. Although the Onihr considered their technology to be highly advanced, Fitz wasn't that impressed by it. While their ships were so powerful that it was calculated that the Onihr could defeat Earth a few decades from now in conflict in a matter of minutes with no casualties sustained by the Onihr, and they claimed to have harnessed black holes to power their time-travel experiments, their holographic technology was primitive compared to some of the holographic systems that Fitz had encountered, and their 'pain inducer' simply made Fitz remember past experiences where he had been in pain rather than experience fresh pain, with the result that he was actually more comfortable when he was being tortured by the Onihr as the inducer distracted him from the pain he was already feeling from recent injuries. Despite their comparatively limited technology by alien standards, they were still a dangerous threat to Earth, prompting Fitz to use a hand-held information computer they had provided him with to teach him how to overload their primary weapon - a massive cannon that would emit an EMP burst that would shut down all of Earth technology - to backfire and destroy the Onihr fleet, with Fitz and a few Onihr only escaping the explosion by teleporting to Earth at the last minute. Although the surviving Onihr were initially prepared to wage war, Fitz - still posing as The Doctor - was able to convince them to depart, simultaneously managing to get rid of a crooked arms dealer named Baskerville who had been using a fake time machine to try and gain access to a super-computer that would allow him to control the world's money, informing the Onihr that Baskerville had destroyed their ship so that the Onihr would take him away to face judgement. 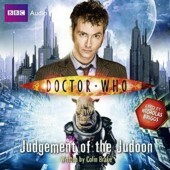 In contrast with the Onihr, the Judoon are far less intelligent and essentially benevolent, uninterested in conquest and apparently willing to serve justice by working as enforcers for the Shadow Proclamation. While essentially inter-galactic policemen, the Judoon’s strict adherence to the rules - to the point of having people sign forms when they commander local transports and adhering to local rules even if they don’t have to - and their relatively simple-minded nature have caused them to come into conflict with The Doctor in the past. Even if they often act as official law enforcement officers, the Judoons’ lack of imagination and focus on the task at hand conflicts with The Doctor's ability to see the bigger picture and the shades of grey involved in the current crisis, allowing The Doctor to think of more ways of doing things than the direct course of action favoured by the Judoon. The Doctor's earliest recorded encounter with the Judoon occurred in his fourth incarnation, when he, Leela and K9 were visiting the planet Agratis to see the Jewel of Fawton, the most beautiful gem in creation, just as it had gone missing; the Judoon were hired to find the Jewel, but they were practically decimating the planet to ensure that the lawbreakers returned the Jewel ("Prisoners of Time"). While Leela and K9 kept the Judoon occupied, The Doctor and his friends visited the cavern where the Jewel had been originally found, learning that it had been stolen by a museum employee who believed that it played a vital role in the life-cycle of a race of crystalline creatures who lived in the caves, the Jewel stimulating their hive-mind consciousness. With the crisis averted and the Jewel returned to its original owners, the Judoon quickly ceased their activities, prompting Leela to invite them to the subsequent banquet to show that there were no hard feelings. The Doctor next encountered the Judoon in his fifth incarnation ("The Forgotten"), when they came to Earth to recover the Eye of Akasha, a small glowing red orb of unspecified origin or purpose that The Doctor had acquired at some point prior to his third incarnation and left in his old house on Allen Road. Although the Judoon came to Earth looking for it, the Fifth Doctor was forced to give them the Eye when they threatened Tegan, but, not wanting to trust the Eye to them, he switched it for a cricket ball while they were distracted. These Judoon appeared to be operating outside their remit, as The Doctor informed them that their presence on Earth violated galactic law as it was not neutral territory, warning them that he would inform the Shadow Proclamation if they came to Earth in such numbers again. 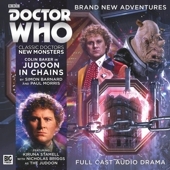 The Sixth Doctor encountered the Judoon once again ("Judoon in Chains") when Judoon Captain Kybo of the 19th Judoon Interplanetary Force fled from the planet Aetia just as the Judoon were assisting Genesis Corp director Meretricious Gedge in preparing the apparently uninhabited planet for terraforming. Responding to a psychic distress call from Kybo's vessel after it was attacked by unidentified ships, The Doctor was intrigued when Kybo actually thanked him for his help, but lost track of Kybo when the Judoon insisted on adhering to protocol and taking the escape pod, which crashed on Earth in 1884. Taken in by a travelling freakshow, Kybo was eventually found by The Doctor, who was briefly forced into another cage to act as Kybo's translator and the circus clown, but the two found an ally in Eliza Jenkins, the circus's dwarf woman. When Kybo started to speak English on his own and even write his own poetry, The Doctor began to realise what was happening before the main Judoon fleet arrived to arrest Kybo for desertion, The Doctor using their need for rules to buy time until he could confirm what he was dealing with. His deductions made, The Doctor insisted that Kybo be tried for desertion in the local court house, which was transported to another planet while The Doctor and Kybo explained what had happened to himâ€¦ including the revelation that Aetia was actually inhabited by a race of pure thought known as the Aetius, who had awakened Kybo's creative potential so that he could explain their dilemma to the Galactic Court until he was shot down by Genesis Corp terraformers, the Aetius having sent the distress call that drew in The Doctor. The other members of Kybo's former platoon briefly panicked when they realised that they were being changed as well, but The Doctor was able to convince them to accept this change and question Meretricious Gedge directly about the recent revelations, drawing Gedge to them using the DNA sample acquired through the Shadow Proclamation's vetting procedure to focus their teleporters. While he admitted that he had known about the Aetians' existence, Gedge defended the decision to terraform the planet anyway by arguing that the Aetians had achieved nothing and he couldn't hesitate just because a few minor creatures would go extinct in the face of saving more 'deserving' races, but he was denounced by The Doctor and the rest of the court as an arrogant fool who was so drunk on his power that he had lost any sight of morality. Gedge attempted to keep his secret by ordering the destruction of the courthouse, but since the courthouse had become a branch of the Galactic Court when it was selected as a venue for Kybo's trial, everything said in it had been broadcast across the galactic public networks. With Gedge's shareholders withdrawing their support of his orders and sacking him from his position until Genesis Corp could be tried for their potential crimes in full, Kybo was found not guilty of desertion due to exceptional circumstances, but the platoon were forced to remain in self-imposed exile due to their transformation, contemplating establishing a commune on Aetius's moon to consider their new status. The Doctor first encountered the Judoon in the televised series when the Tenth Doctor met his new companion Martha Jones for the first time ("Smith and Jones"), The Doctor currently tracking a Plasmavore - a vampire-like alien that could convert its physiology to mimic other races - that had hidden in the Royal Hope Hospital where Martha was doing her internship. With the Judoon unable to actually land on Earth due to its status as a Level Five planet that had no official contact with alien life, they teleported the entire hospital onto the 'neutral ground' of the Moon to conduct their investigation, although the force field they used to contain the atmosphere in the hospital would not replenish the oxygen that was in the hospital when it was initially taken. Only aware that they were searching for an alien that could look human, the Judoon proceeded to scan through every resident of the hospital, but this proved an inadequate solution when the alien they were hunting was revealed to be a Plasmavore that could drink the blood of other species to change its own biology, with the result that she would read as human to the Judoon scanners. With the Judoon chasing The Doctor, he was forced to trick the Plasmavore into drinking his blood so that she would read as alien once again, the Judoon subsequently killing the Plasmavore (Although The Doctor and Martha were left to deactivate the Plasmavore's attempt to turn the hospital's MRI into a weapon that could have fried half of Earth as the Judoon didn't consider the bomb their problem). The Doctor's next encounter with the Judoon took place when he and Martha discovered that Balmoral Castle had vanished in 1902, with King Edward VII still inside it ("Revenge of the Judoon"). With the aid of Captain Henry Carruthers - the King's personal aide - and his friend and colleague Doctor Arthur Conan Doyle, The Doctor and Martha quickly determined that the Judoon were responsible, Doyle and Carruthers having already discovered some of the beacons that the Judoon had used to focus their teleportation systems when preparing to take the castle. While Martha, Carruthers and Doyle tracked the source of the beacon - which had been given to Doyle by a small society known as the Cosmic Peacemakers -, The Doctor traced Balmoral Castle to the Empty Quarter, a particularly deserted part of the Arabian Desert, with three Judoon ships maintaining a force field around the castle. As Martha and Carruthers realised that the Cosmic Peacemakers had access to advanced technology and were manipulating Doyle's memory, the Cosmic Peacemakers took them to Balmoral Castle, where they revealed their plans to ensure peace on Earth by planting temporal reversion devices in capital cities around the globe, erasing the cities and their rulers from history and thus making it easy for Britain to take control of the world, with the Judoon providing security for the society. Although aware of the dangers of this method, The Doctor convinced Edward to go along with it so that the Cosmic Peacemakers wouldn't make the offer to a less scrupulous ruler, giving him time to determine that the Judoon had been tricked into participating in such an unlawful plan by the Captain of the society manipulating the relevant legal documentation. With this deception exposed, the Judoon deserted the society's leaders, leaving The Doctor to activate the central control device with the sonic screwdriver so that the society's leader erased his own timeline, leaving The Doctor and Martha to collect the temporal reversion devices after extracting a promise from the Judoon that they wouldn't interfere with Earth again. The Doctor had a brief encounter with the Judoon when he contacted the Shadow Proclamation for assistance after Earth was stolen from literally under the TARDIS while he and his companion Donna Noble were travelling back to Earth to investigate a recent cross-reality warning from the long-lost Rose Tyler about a threat that would cause the stars to go out ("Turn Left"). When The Doctor and Donna visited Earth to investigate the warning, the entire planet was stolen from underneath the TARDIS by the Daleks, prompting The Doctor to contact the Shadow Proclamation for help, being greeted by the Judoon upon his arrival. Although the Shadow Proclamation asked The Doctor to lead them into battle when he determined a means of tracking where Earth had been taken, he departed in the TARDIS on his own, leaving the Judoon and the rest of the Shadow Proclamation's army behind as he recognised that this situation required his stealth tactics rather than a simple brute force assault ("The Stolen Earth/Journey's End"). When a prison ship crash-landed on Earth, a Judoon was sent to track the lost prisoner, subsequently joining forces with the Bannerman Road gang - a group 'led' by The Doctor's old companion Sarah Jane Smith - to better search for the prisoner due to their superior local knowledge. Although the investigation was hampered by the Judoon's focus on protocol - allowing the Shade they were tracking possessed Sarah Jane herself and nearly programmed her alien supercomputer Mr Smith to explode -, they were eventually able to disarm Mr Smith, track down the Shade and rescue Sarah Jane ("Prisoner of the Judoon"). However, the Judoon sentenced Clyde and Rani to be confined to Earth for their interference in the investigation, which would have consequences later on when an alien race seeking their lost prince left Clyde and Rani on Earth after teleporting the rest of the human race off-planet to avoid provoking the Judoon by violating their decree ("The Empty Planet"), allowing Clyde and Rani to find the missing prince - a half-human shielded from the robots' scanners by a unique ring his father had left him - and return him to his people. The Doctor also joined forces with the Judoon when he was investigating the mysterious Invisible Assassin on the colony world of New Memphis, with the aid of ruthless Judoon commander Rok Ma and teenage private detective Nikki ("Judgement of the Judoon"). With Judoon forces so focused on searching for the Invisible Assassin that they were virtually ignoring the civilian casualties they left behind, The Doctor was alerted to the danger when he materialised on a spaceship where the Judoon had just been searching, narrowly repairing the life-support system in time to save the ship's crew and passengers before following the Judoon to New Memphis, a major hypergalactic travel hub. With various problems plaguing Terminal 13 upon his arrival - including the TARDIS being taken by an unknown source -, The Doctor convinced Commander Rok Ma to accompany him on a search rather than lead the Judoon in an unrest-provoking mass search, encountering Nikki while searching for a local gangster that she was also spying on for a client. Tracking their respective targets using Nikki's knowledge of the local criminal underworld, Rok Ma's strength and authority and The Doctor's natural intellect, the trio of investigators eventually discovering that the 'Invisible Assassin' was a short-lived virus used by the gangsters against their enemies. Having defeated an attempt to stage an underworld coup that would have killed hundreds of innocent people as bombs were detonated in key areas around the city - Rok Ma's troops disarming the bombs while The Doctor, Rok Ma and Nikki captured the instigators of the crisis -, The Doctor departed, Rok Ma deciding to resign from the Judoon fleet and join Nikki and her father at their agency. The Eleventh Doctor was briefly pitted against the Judoon when they joined the Alliance, a vast army of aliens including many of The Doctor's old enemies ("The Pandorica Opens/The Big Bang"), to trap him in the Pandorica - a legendary prison that had been spoken of in myth, created specifically to hold The Doctor - after they became convinced that he would be responsible for a temporal explosion that triggered the creation of cracks in the universe after the TARDIS exploded, unaware that the explosion had already taken place when his future companion River Song was piloting the ship. With the collapse of history, the various races in the Alliance were all erased from existence, leaving only statues of themselves gathered around the Pandorica as 'after-images', Earth the last fragment of time left in the universe thanks to the exploding TARDIS putting itself in a time loop at the moment of its destruction to act as a substitute sun for Earth. With The Doctor having taken the Pandorica into the TARDIS explosion, using the TARDIS itself as a power source to transmit the remaining atoms of the true universe stored within the Pandorica across all of time and space in a second explosion that restored the history of the universe, the Alliance was erased and history restored. A group of Judoon worked with The Doctor again when the Eleventh Doctor attacked the Demon's Run asteroid to rescue his companion Amy Pond and her newborn daughter Melody from The Silence, a mysterious cult who believed that The Doctor was destined to end the universe ("A Good Man Goes to War"). His allies during this attack included a few Judoon, as well as assorted human allies, a Sontaran he had 'sentenced' to become a nurse, and a Silurian warrior who had set herself up as an 'investigator' in Victorian London, with the Judoon surviving the resulting battle.